It has long been accepted that climate change and global warming are problems that must be resolved, and the sooner the better. One of the the solutions that has been hitting the social media networks recently is the idea of solar roads. 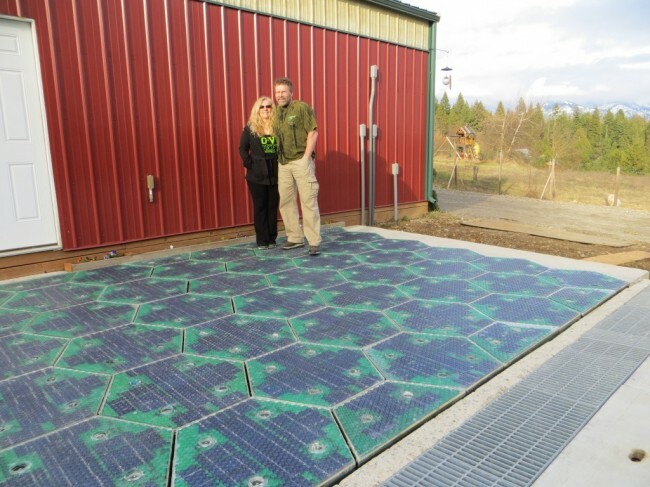 The belief that climate change can be combated with something as easily achievable as solar roadways is incredible. The solution has never seemed more simple. The couple that came up with the idea received a contract in 2009 from the Federal Highway Administration (FHA) and have been creating prototypes ever since. So far their amazing idea has been working. and Julie and Scott Brusaw have decided to go public. They presented their idea at Tedx Talks in 2010, and have been documenting the process on their YouTube channel. At first glance it may seem that changing how our roadways are constructed is too much hassle with minimal impact on the environment, but it seems as if the Brusaw family is onto something here. People travel the world, always using roads. Many roads are kept in poor condition, full of potholes and cracks. Many roads are in dire need of replacement. Just imagining all of the roadways in the United States alone is mind-boggling. While Scott and Julie have calculated the sheer length of roads in the U.S. to be roughly 72,000 kilometers, it is important to consider the entire world. Climate change is not something that only affects the U.S., it is everywhere. This can be seen by the increasing amount of countries which are concerned with global warming. The best representation of these countries is something called the Kyoto Protocol, which is an international treaty which is focused on combating climate change. The protocol has been signed by 192 parties, including 191 different nations and the European Union. While there is a short list of countries which have not signed the protocol, that does not mean they are not working on finding solutions to global warming. The list of countries which have not signed the Kyoto Protocol include Andorra, Canada, South Sudan and the United States. One hundred and ninety two parties mean a lot kilometers of roads. If all of these roads were created out of solar panels, it would become increasingly easy to combat climate change. These roads would provide the drivers with light, and would be safer for pedestrians, animals and, of course, drivers. They would create more energy than we could ever imagine. The sun is one of the very few unlimited resources to which we have access. The sun is not expensive, and should be used effectively for the benefit of the people living on this planet. While solar panels are more expensive to make now, the sooner investments are made into modification of our roads, the cheaper they will become. The drive toward solar powered roads will create new job opportunities and allow for many secondary benefits, including the lack of unsightly power lines, the idea of never shoveling the driveway, and increased safety for anyone who uses the roads. While the complete changeover to solar roads would take many years, it is a worthwhile investment. After all, the goal is for humanity to clean up Earth. When that goal is reached, it will be a moment worth celebrating. 15 Responses to "Climate Change Combated With Solar Roads [Video]"
I’d imagined solar arrays on roofs OVER roadways, parking lots, large buildings. Here you propose putting the directly (or almost directly) on the ground. Terrific. BUT — Will heavy trucks, military vehicles (tanks), heavy building machinery (bulldozers) etc. NOT ruin these solar panels?